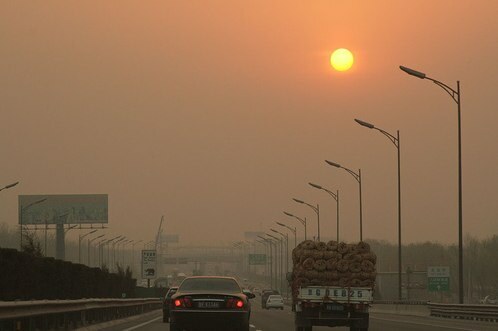 A gloomy sunset on Beijing’s 5th Ring Road. Flickr photo by Lim CK. The goal is to remove more than 350,000 huangbiaoche, or “yellow-label cars” that fail to meet emission standards, by the end of this year. These cars represent only 10 percent of the total number of cars in the city but contribute to 50% of emissions, according to Du Shaozhong, deputy director of the environmental protection bureau. Yellow-label vehicles are those that do not meet the Euro I emission standard, which was adopted in China in 1992. “The new subsidies are designed to encourage people to stop using heavy polluting vehicles,” Du said. From tomorrow until the end of next year, owners of yellow-label vehicles will be given up to 25,000 yuan ($3,700) as a reward if they stop using their vehicles. And drivers will be subsidized if they purchase environmentally friendly ones, he said. This past week, the Shanghai Daily reported that “Chinese consumers in 13 cities will receive a financial subsidy if they buy energy-saving and new energy cars,” including hybrid cars, electric cars and fuel cell vehicles. No other details about the subsidy have been specified. Consumers aside, the central government so far has pledged to give 10 billion yuan ($1.46 billion) over the next three years to help automakers upgrade their technology and develop alternative energy vehicles, Xinhua says. What this plan doesn’t really address is how to get people to stop using cars altogether. But it’s unlikely that China would promote such an idea, seeing as the auto industry “is part of China’s economic backbone,” as Treehugger says. Retail sales of passenger vehicles in China, excluding exports, rose 7.4% to 6.43 million units in 2008, according to Forbes magazine. Rare Earth Minerals Making Hybrid Cars Even Rarer?